, a prelate of the most distinguished character and abilities, was born at Wantage in Berkshire, in 1692. His father, Mr. Thomas Butler, who was a reputable shopkeeper in that town, observing in his son Joseph an excellent genius and inclination for learning, determined to educate him for the ministry, among the protestant dissenters of the presbyterian denomination. For this purpose, after he had gone through a proper course of grammatical literature, at the free grammarschool of his native place, under the care of the rev. Mr. Philip Barton, a clergyman of the church of England, he was sent to a dissenting academy, then kept at Gloucester, but which was soon afterwards removed to Tewkesbury, the principal tutor of which was Mr. Jones, a man of uncommon abilities and knowledge. 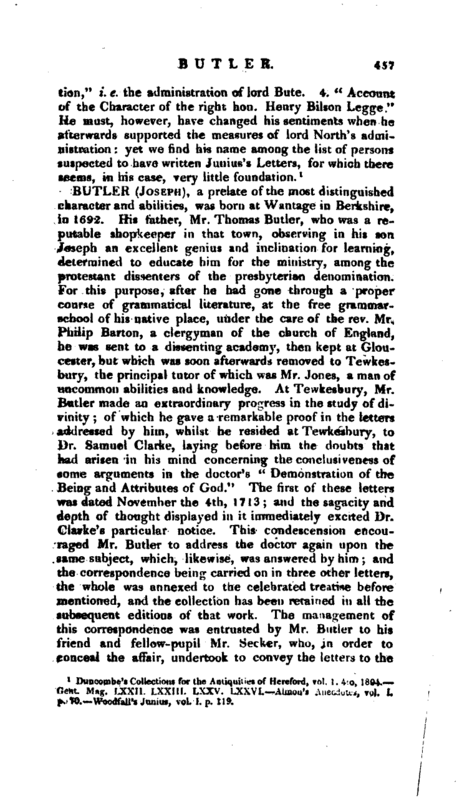 At Tewkesbury, Mr. Butler made an extraordinary progress in the study of divinity; of which he gave a remarkable proof in the letters addressed by him, whilst he resided at Tewkesbury, to Dr. Samuel Clarke, laying before him the doubts that had arisen in his mind concerning the conclusiveness of some arguments in the doctor’s “Demonstration of the Being and Attributes of God.” The first of these letters was dated November the 4th, 1713; and the sagacity and depth of thought displayed in it immediately excited Dr. Clarke’s particular notice. 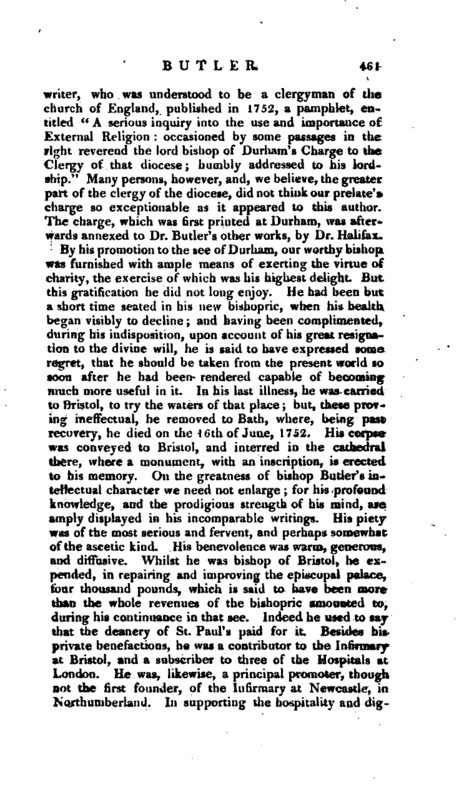 This condescension encouraged Mr. Butler to address the doctor again upon the same subject, which, ^likewise, was answered by him; and the correspondence being carried on in three other letters, the whole was annexed to the celebrated treatise before mentioned, and the collection has been retained in all the subsequent editions of that work. The management of this correspondence was entrusted by Mr. Butler to his friend and fellow-pupil Mr. Seeker, who, in order to conceal the affair, undertook to convey the letters to the | post-office at Gloucester, and to bring back Dr. Clarke’s answers. 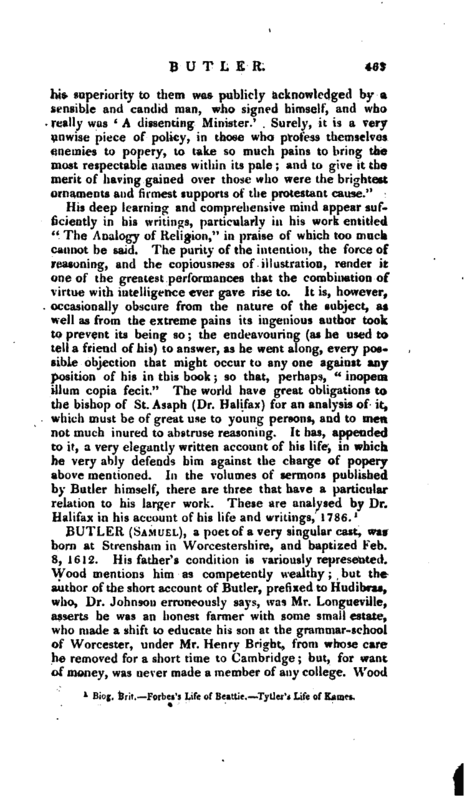 When Mr. Butler’s name was discovered to the doctor, the candour, modesty, and good sense with which he had written, immediately procured him his friendship. Our young student was not, however, during his continuance at Tewkesbury, solely employed in metaphysical speculations and inquiries. Another subject of his serious consideration was, the propriety of his becoming a dissenting minister. Accordingly, he entered into an examination of the principles of non-conformity; the result of which was, such a dissatisfaction with them, as determined him to conform to the established church. 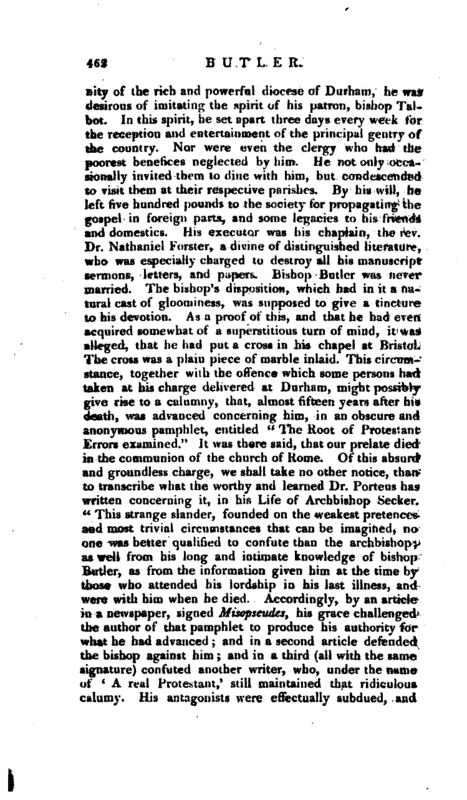 This intention was at first very disagreeable to his father, who endeavoured to divert him from his purpose; and with that view called in the assistance of some eminent presbyterian divines; but finding his son’s resolution to be fixed, heat length suffered him to be removed to Oxford, where he was admitted a commoner of Oriel college, on the 17th of March, 1714. At what time he took orders is uncertain, but it must have been soon after his admission at Oxford, if it be true, as is asserted, that he sometimes assisted Mr. Edward Talbot in the divine service, at his living of Hendred near Wantage. With this gentleman, who was the. 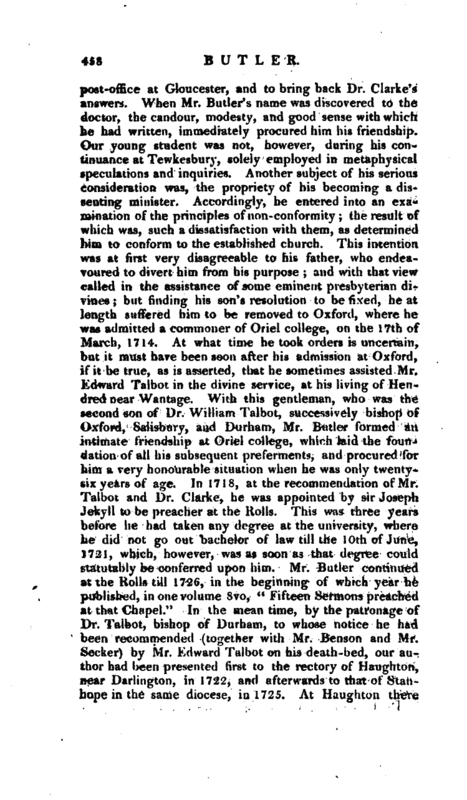 second son of Dr. William Talbot, successively bishop of Oxford, Salisbury, and Durham, Mr. Butler formed an intimate friendship at Oriel college, which laid the foundation of all his subsequent preferments, and procured for him a very honourable situation when he was only twentysix years of age. In 1718, at the recommendation of Mr. Talbot and Dr. Clarke, he was appointed by sir Joseph Jekyll to be preacher at the Rolls. This was three years before he had taken any degree at the university, where he did not go out bachelor of law till the 10th of June, 1721, which, however, was as soon as that degree could statutably be conferred upon him. 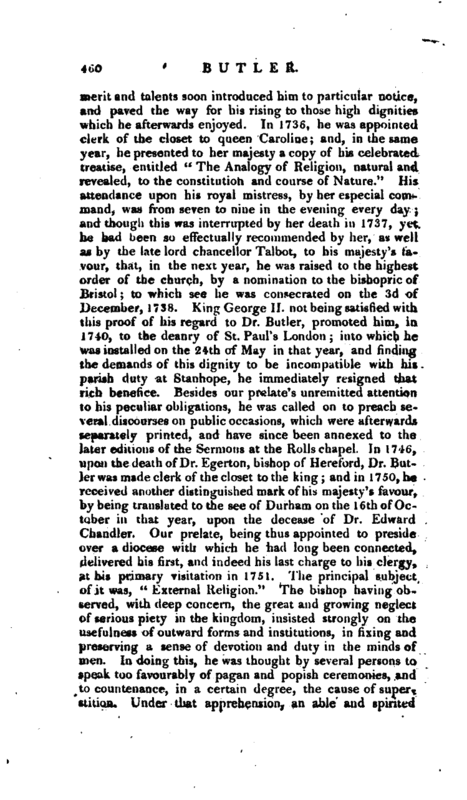 Mr. Butler continued at the Rolls till 1726, in the beginning of which year he published, in one volume 8vo, “Fifteen Sermons preached at that Chapel.” In the mean time, by the patronage of Dr. Talbot, bishop of Durham, to whose notice he had been recommended (together with Mr. Benson and Mr. Seeker) by Mr. Edward Talbot on his death-bed, our author had been presented first to the rectory of Haughton, near Darlington, in 1722, and afterwards to that of Stanhope in the same diocese, in 1725, At Haughton there | was a necessity for rebuilding a great part of the parsonagehouse, and Mr. Butler had neither money nor talents for that work. 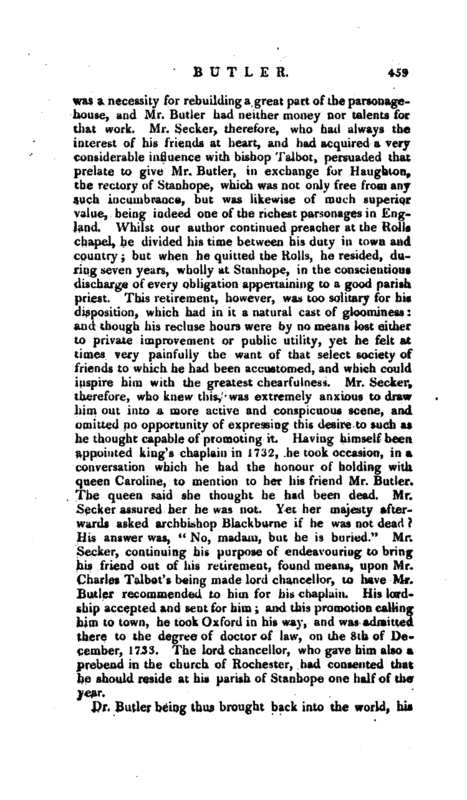 Mr. Seeker, therefore, who had always the interest of his friends at heart, and had acquired a very considerable influence with bishop Talbot, persuaded that prelate to give Mr. Butler, in exchange for Haughton, the rectory of Stanhope, which was not only free from any such incumbrance, but was likewise of much superior value, being indeed one of the richest parsonages in England. Whilst our author continued preacher at the Rolls chapel, he divided his time between his duty in town and country; but when he quitted the Rolls, he resided, during seven years, wholly at Stanhope, in the conscientious discharge of every obligation appertaining to a good parish priest. This retirement, however^ was too solitary for his disposition, which had in it a natural cast of gloominess: and though his recluse hours were by no means lost either to private improvement or public utility, yet he felt at times very painfully the want of that select society of friends to which he had been accustomed, and which could inspire him with the greatest chearfulness. Mr. Seeker, therefore, who knew this, was extremely anxious to draw him out into a more active and conspicuous scene, and omitted no opportunity of expressing this desire to such as he thought capable of promoting it. Having himself been, appointed king’s chaplain in 1732, he took occasion, in a conversation which he had the honour of holding with queen Caroline, to mention to her his friend Mr. Butler. The queen said she thought he had been dead. Mr. Seeker assured her he was not. Yet her majesty afterwards asked archbishop Blackburne if he was not dead? His answer was, “No, madam, but he is buried.” Mr. Seeker, continuing his purpose of endeavouring to bring his friend out of his retirement, found means, upon Mr. Charles Talbot’ s being made lord chancellor, to have Mr. Butler recommended to him for his chaplain. His lordship accepted and sent for him; and this promotion calling him to town, he took Oxford in his way, and was admitted there to the degree of doctor of law, on the 8th of December, 1733. The lord chancellor, who gave him also a prebend in the church of Rochester, had consented that he should reside at his parish of Stanhope one half of the year. Biog. Brit.—Forbes’s Life of Beattie.—Tytler’s Life of Kames.